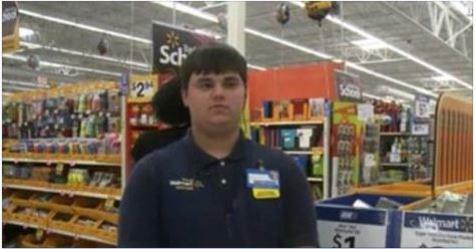 An 18-year-old college-bound Wal-Mart employee from Bryant, Arkansas, is paying it back in a heartwarming way (video below). Kristopher Hudson works five days a week at the local Wal-Mart to earn money for tuition. To him, the job is more than just a paycheck. “I like to interact with customers. I like to ask if there’s any questions that they have, or if they have a problem, I would like to try and solve that for them,” says Hudson. “It really is my way of paying it back,” he adds. It’s clear Hudson is dedicated to helping others. He’s been purchasing items for the back-to-school blitz supply drive, filling the bins with school items for children in need — all with money from his own salary, according to Little Things. Hudson proves that a little money can go a long way. “I got $66, I came in, and I bought 309 items with that money,” he says. And the 18-year-old’s charitable actions are inspiring others around him. Ty McCollum, the assistant manager at the Bryant Wal-Mart, told USA Today that others will chip in to help after seeing Hudson’s good deeds. So why does he do it? Because he knows it’s something that would have made his mother proud. “One thing she always told me and my brothers was, ‘Always encourage others. The best feeling you’ll ever have is when you get to help someone out,'” says Hudson.